This is the next screen you will see. Simply fill in the blanks with what you know. RootsFinder's clean intuitive interface makes it easy to grow your tree. If you don't know a particular fact, leave it blank. If you don't know the name of the person, enter the word "Unknown" or something else that will let you know you are looking for a name. In the place fields, just start typing. RootsFinder is interfaces with the WeRelate Place Database of standardized places. 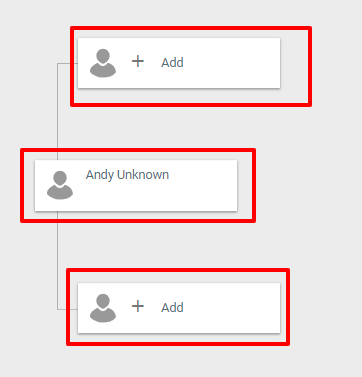 You will see a list of matching places will drop down. Select the one you want. 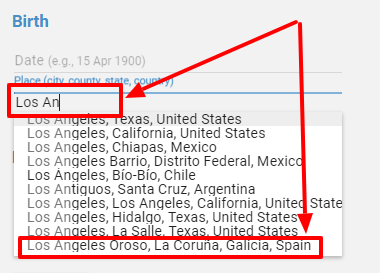 It's always better to use standardized place names because they have coordinates which is necessary for functions, and they are linked to data about the place that can help in your research. 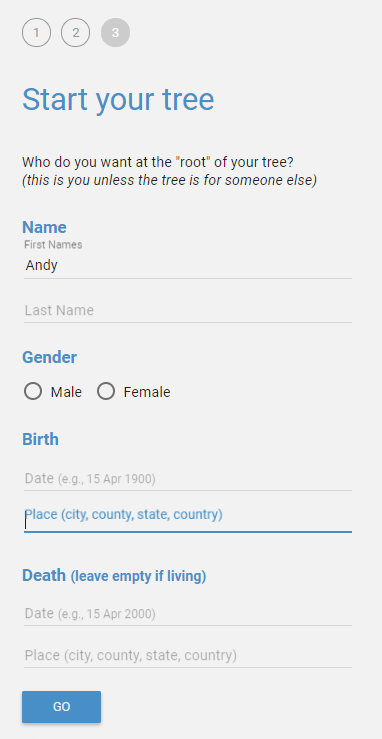 The "GO" button will turn blue when you have enough information to create a person in your tree. Next you will see your first tree. 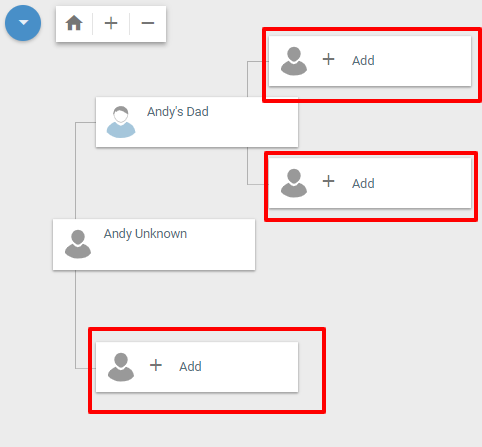 Click on the person when you want to add more information. 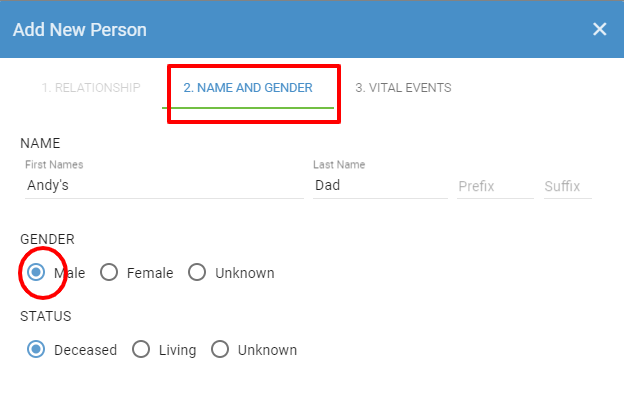 Under the Name and Gender tab you can create a new person. Fill in what you know. 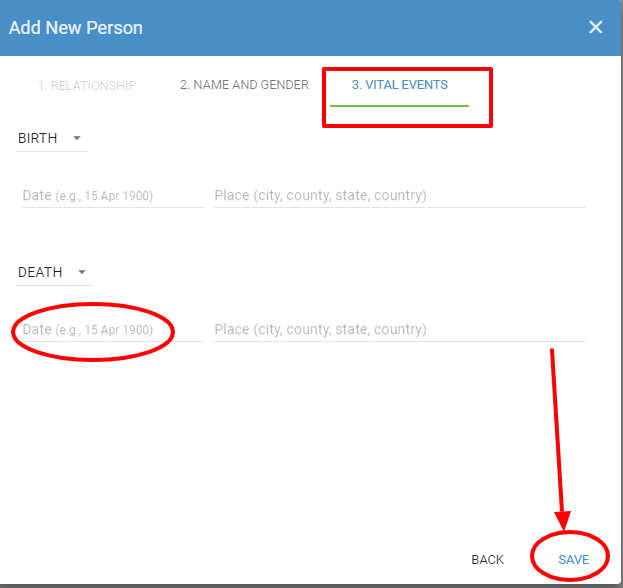 Under the Vital Events tab, you can enter birth and death information for the new person. Don't forget to save. Now you repeat the process to extend your tree.